::(Welcome to Island Pearl Holidays, Maldives - Handhufushi Resort and Spa - Handhufushi Resort & Spa, surrounded by a beautiful lagoon and long stretches of white, sandy beach, is the only resort on the island of Herathera, a 20 minute speedboat transfer from Gan International Airport,Addu Atoll is the southern most Atoll in the Maldives, about 65 km (42 miles) South of the Equator and about 480 km (300 miles) south of Male'. Addu has 32 islands forming the outline shape of a heart 18 km (11 miles) wide x 15 km (10 miles) long, creating the longest stretch of coral reef and beach and the largest lagoon in the Maldives. Of the 32 islands, 6 are inhabited, 1 is the airport island of Gan and 25 are uninhabited. 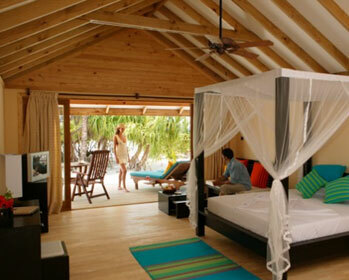 Two main “sister” restaurants - The Kilhi for Beach Villa guests and The Keimaa for Jacuzzi Beach Villa guests. 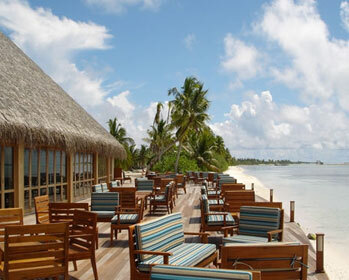 Both restaurants feature the same “all you can eat” buffet style meals for breakfast, lunch, and dinner, served in a traditional open-air dining room with sand floor and thatch roof. Two “optional” à la carte dinner restaurants - The Kalhibih specializing in a grilled seafood menu and the Malaafah, specializing in Thai and Indian Cuisine. An “optional” snack menu is available to guests seated around the swimming pools or at the bars. Three “optional” special choices - Room Service, Beach Dinners For Two, and Gala Theme Night Beach Dinners! 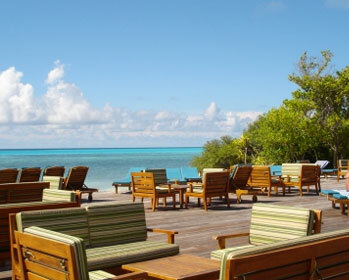 The Meeraa Bar is located near Reception beside the swimming pool. 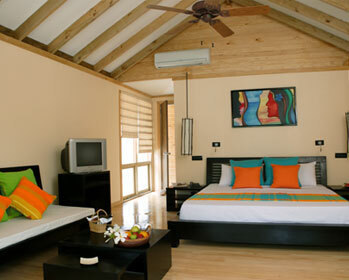 The Dhoni Bar is located in the Beach Villas area beside the swimming pool. 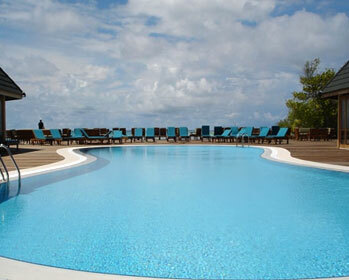 The Dhoaraa Bar is located in the Jacuzzi Beach Villas area beside the swimming pool. Beverage is served in the two main buffet dining rooms, the two à la carte dinner restaurants, from the snack menu and for room service and special events. Herathera SCUBA Centre features Guided Diving and Snorkeling Boat Trips, Equipment and Accessory Sales, Rental and Repair, and a complete PADI Instructional Program. Herathera Windsurf & Sailing Centre for rental and instruction, as well as Kayaks and Glass Bottom Boats. Entertainment: Weekly nighttime program including Bodu Beru Cultural Dance Show, DJ Disco, Divers’ Video, Movies, Crab Races, Live Band, Table Tennis Tournament, and more! Nature Trail and Garden Tours. Activities; Guided Excursions including Snorkeling, Sunset Cruise, Sightseeing Tours to Gan and nearby islands, Island Hopping, Love Boat Daysail, Photo Flight, Robinson Crusoe Island, and more! Weekly program including Pool Games, Water Polo, and Sports Tournaments Board games are available from the bars including Chess, Checkers, Scrabble, Caramboard, and more! Internet Café for email and web browsing and a lending Library where you can take or donate a book. Herathera Jewelers; offers a complete selection of Gemstones and Jewelery at reasonable prices. Meeting and Banquet Facilities: Two air-conditioned classrooms, each seating up to 30 guests, and an open-air Hall, island style, with overhead ceiling fans and sand floor, for functions up to 100 guests. All Inclusive Package…to enjoy the exceptional value of this “optional” plan, which includes unlimited “all you can drink” alcoholic and non-alcoholic beverage, all day “tea”, one Night Fishing Excursion, one Sunset Cruise, daytime use of the Tennis Courts, the Fitness Center, the Kayaks, and a half hour group lesson for snorkeling and windsurfing. Addu Atoll is the southern most Atoll in the Maldives, about 65 km (42 miles) South of the Equator and about 480 km (300 miles) south of Male'. Addu has 32 islands forming the outline shape of a heart 18 km (11 miles) wide x 15 km (10 miles) long, creating the longest stretch of coral reef and beach and the largest lagoon in the Maldives. Of the 32 islands, 6 are inhabited, 1 is the airport island of Gan and 25 are uninhabited. The Gan International Airport serves both domestic and international flights, much the same as Male', and traces its origins to the British as a Royal Air Force base during WWII. The islands on Addu's western side, from south to north, include Gan, Feydoo, Maradhoo Feydoo, Maradhoo and Hithadhoo. The islands on Addu's eastern side, from north to south, include Hulhudhoo, Meedhoo, Herathera (Herathera Island Resort), Gesskalhuhera, Mulikede, Villingili (ShangraLa Island Resort) and Madihera. The weather in Addu is the same as the rest of the Maldives, the air temperature averages 30 C (86 F) and the water temperature about 27 C (81 F). The population of Addu is almost 30,000, second only to Male's 75,000 residents. Half of Addu's residents live on Hithadhoo, the capital island where there is a secondary and a higher secondary school, a regional hospital, a telecommunications center, a fish processing plant, and a regional port (under construction). The paved road from Gan has bridges which link to Feydoo, Maradhoo and Hithadhoo, a distance of 17 km (11 miles), and is the longest road and connecting to the largest land mass in the Maldives. 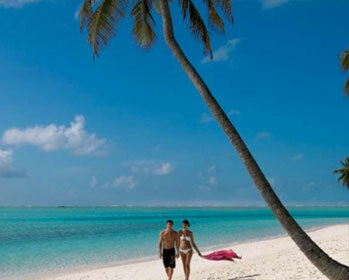 In addition to the national language, Dhivehi, a local dialect is spoken as well as English. 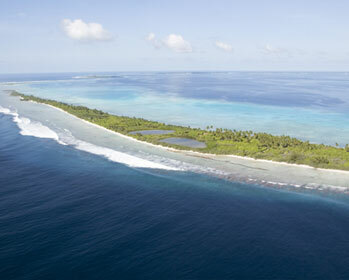 The word atoll is derived from the Dhivehi word atholhu. Indian traders named the country Maladiv, from the Sanscrit for ‘garland of islands'. Dhivehi belongs to the Indo-Iranian language group, closest to ancient Sinhala with links to Sanskrit and other ancient tongues from north-west India, as well as elements of Tulu from the Malabar Coast of Southern India, with its Tamil roots. The local economy is based on fishing, agriculture, construction and tourism.